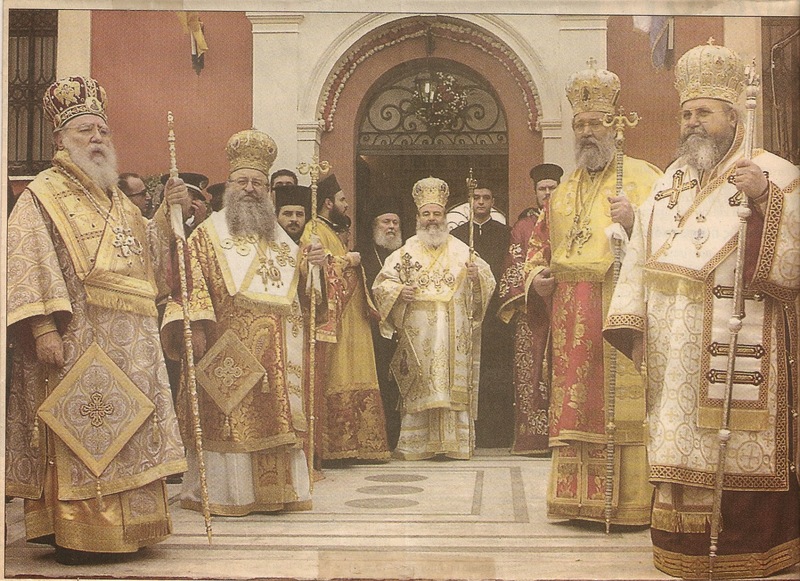 In the same way each member of the clergy, starting with deacons, then priests, then bishops take on a heavier spiritual load as they move up the hierarchy, their liturgical costumes increase in volume as well until a bishop or archbishop who does not have a fair bit of stamina might find himself not just engulfed but literally weighed down by the burden of office during a liturgy. This photograph of a group of bishops with the archbishop in the center appeared in the newspaper Kathimerini on Feb 27, 2005 and is one of my favorites. Note that the stiff costumes seem separate from the bodies inside, - these bishops, radiating pre-crisis confidence, are living icons. Generally speaking the paraphernalia belonging to the office of the deacon is added to when the deacon becomes a priest and again when the priest becomes a bishop. Since material symbols of office are worn over the rason and exorason when a clergyman officiates at a service, liturgical dress takes a fashionista’s concept of layered about as far as it can go. The result is spectacular but trying to keep its complexity intact as well as interesting in a readable text is a challenge. Be prepared: the meaning attached to each and every liturgical garment would make even the most ardent student of symbols blush; it is hard to know whether these garments had the same symbolic gravitas from their inception or whether some of the meanings have been added in retrospect. This long sleeved loose fitting garment reaches to the floor. It has to be roomy because it is worn over the rason and exorason. 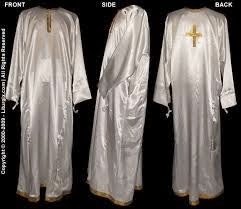 Originally it was white and said to represent purity, the purity of the baptized, and the white robe of the angel who announced to the Myrrh bearing women the glad tidings of the Lord's Resurrection (Mark 16:5). The white colour, symbolism notwithstanding, went by the boards even in Byzantine times. Apparently the Emperor who had a quasi-religious status enabling him to participate partially in services and to preach sermons (1), would wear costumes more colourful and elaborate than his churchmen and, he was in the habit of offering his gowns as gifts to individual clergymen as signs of favour. These gifts were then worn as a mark of honour during subsequent liturgies. That is one story anyway. What is true is that the vestments of the clergy started to take on the imperial colours. This trend continued, especially after the fall of Constantinople in 1453 because at that time the Church took on many of the duties of the deposed emperor under the Ottoman Millet system. In fact, some writers on the subject suggest that the Church simply took over the Imperial wardrobe. Short of a time machine, I do not see quite how these stories can either co-exist and both be true – another example, if one were needed that history is sometimes a matter of picking your story and sticking to it! 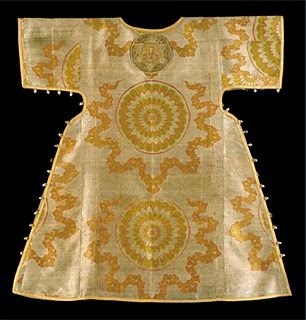 It is a long narrow strip (just over three meters) of highly embroidered material (angels or their symbols, crosses) worn over the left shoulder with one end going down the back and the other wrapped around the body. The part in the front is raised slightly by the deacon’s right hand when he recites prayers. The part of the orarion, raised by the deacon, represents the New Testament and the part hanging down his back, the Old. The word orarion comes from the Latin word ‘to pray” Symbolically it represents the wings of angels who, like the deacon, are servants of God. The servant part is easy; the word deacon in Greek means servant. But a long narrow stole representing wings is quite a stretch. Suffice it to say that, from the point of view of a visitor, this elegant stole is the tip off that there is a deacon inside. 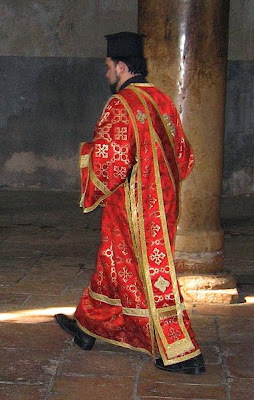 This is the same garment worn by the deacon except that sticharion of priests and bishops is often made of lighter material than the heavier brocaded sticharia of deacons. This helps compensate for the weight of the other garments their rank entitles them to wear. The cuffs are worn around the wrists of the priest as they are by the Deacon and for the same reason. This elaborate piece, often decorated with gold crosses, is a specialized type of orarion particular to the priest and never worn by a deacon. It hangs down to the floor over the stichario. The word epitrachilio means something around the neck and it is placed around the neck like a yoke symbolizing the priest’s submission to Christ. This strip of cloth belt is worn as a belt over the epitrachilio and sticharion. Ιτ has a cross in the middle and symbolizes the strength given to the priest by the Ηoly Spirit. God gave instructions to Moses for making it (Exodus 36:37) As the priest dons it he says the following prayer from Psalm 18:32 It is God that girdeth me with strength, and maketh my way perfect. While verifying that the number of the above Psalm was correct, my eye fell to the next verse (33) which says He maketh my feet like hind’s feet and setteth me upon my high places. Happily, the vestments’ literal kinship to Biblical script ceases at the ankles. Priest tends to wear black brogues, something of a relief. http://www.youtube.com/watch?v=ml93qmng-dE shows a priest readying himself for the liturgy. The Bishop wears the sticharion, epitrachelion, zone, epimanika, and the epigonation. This rhombus shaped hard fabric is decorated with an embroidered cross, the figure of the Savior or an angel. In spirit, if not in shape, it represents the sword from Psalm 45: 3-5: Gird thy sword upon thy thigh…. And thy right hand shall teach terrible things The priest or bishop recites the lines from the psalm when he puts on the epigonation. The Sakkos is the bishop’s edition of the pholonion, exclusive to him and very grand. Originally this sumptuous vestment was worn only by the Byzantine Emperor. It is shorter than the Sticharion and has wide, shorter sleeves. Over time it was adopted by all bishops as a sign of their rank. This long narrow band of brocade, exclusive to the bishop, is worn, stole-like, over the sakkos and around the neck and shoulders (its name means worn on the shoulder). 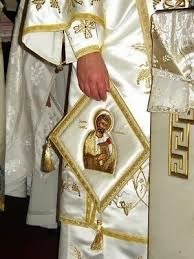 It is worn by the Bishop from the beginning of the Divine Liturgy until the reading of the Gospel because, until then, he represents the Arch-priest, Christ. The Omophorion is the symbol of his spiritual and ecclesiastical authority. Clergy and ecclesiastical institutions subject to a bishop's authority are often said to be "under his omophorion." By symbolizing the lost sheep that is found and carried on the Good Shepherd's shoulders, it signifies the bishop's pastoral role as the icon of Christ. Because it can be difficult to keep around the shoulders during some parts of the service, a less cumbersome version called the Small Omophorion (το μικρό ωμοφόριο) is worn after the Gospel reading until the conclusion of the Divine Liturgy. This cross of precious metal and jewels is worn over the Omophorion as a reminder that the Bishop bears his cross and upholds the commandments of Scripture. When he puts on the cross he prays: Whoever desires to come after Me, let him deny himself, take up his cross and follow Me. (Luke 9:23) Some priests are honoured to wear this cross as well. A highly decorated round or oval image of Christ or the Theotokos is worn on a chain over the Omophorion and is a sign of the purity of heart which a Bishop should possess. It is the official distinctive sign of the Bishop which he may wear at all times, even over non liturgical vestments. When he puts on the Englopion he prays: Create in me a pure heart, O God, and renew a steadfast spirit within me. The Mitra (Mitre, Crown) in Orthodoxy is an elaborate affair. It is decorated with small images of Christ and the four Evangelists within the frames of precious stones, and bears the cross on top. 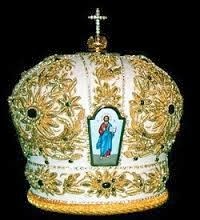 It symbolizes the glory of the Lord and the highest ecclesiastical authority which is given to a Bishop.In some churches the Bishop’s throne is topped by a mitra; that certainly makes it clear to for whom it is reserved! 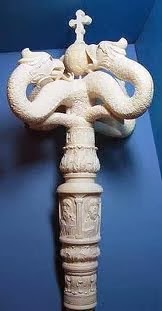 This tall staff topped by two serpents with a cross in the center is a sign of the Bishop's authority. The serpents (poor old serpents) represent the visible and invisible enemies of the Church and the Cross symbolizes the power which Christ has granted to the Church and is entrusted to the Bishop. The staff is a reminder of Moses, another leader who led his people to the Promised Land. By now you should now be able to distinguish the three ranks of clergy from each other and be able to identify every vestment worn by the bishops in the picture at the beginning. It should be obvious that these garments mask the shape of the human body, quite intentionally because of the spiritual nature of the offices. 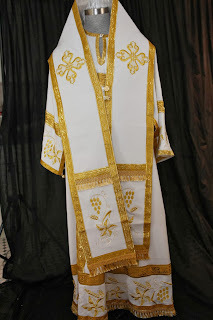 If you think that the sensual nature of the richly embroidered materials, gold trim, precious metals and so on goes a long way to counter this, then remember that, according to the Church, all of this wealth and richness is meant, not to honour the priest, but to honour God with whose sacred character they are clothed only to celebrate the liturgy. Any visitor to Athens who happens to be in the area of the Metropolitan Cathedral will notice many, many stores selling sumptuous liturgical garments. In the Byzantine era, many of these would have been lovingly made by hand in nunneries or by pious women and gifted to the church. Today some may still be gifted but they are less likely to be handmade, unless by hired tailors and seamstresses. In the world outside of the church doors, vestments are a big business. And, like so many other commodities today, they are also sold on line. You can even buy vestments on e-Bay. In this regard, www.liturgix.com is worth a look. But there are hundreds of sites. Most have special offers, hints about washing and ironing, and even some marketing savvy. One site was offering a “Corinth” model. One supposes the possibilities are endless. A set of priests’ vestments including sticharion, epitrachilion, phelonion. epimanikia and epigonion costs in the neigbourhood of 1000 dollars. Bishop’s vestments are just that much more with the crown alone costing between dollars 650 dollars and 1900 dollars depending on the number of icons and whether they are hand painted. Non liturgical garments do not come cheap either. A rason or exo-rason can be around 175 dollars for a synthetic material (In Greece In summer?) and from 230- to 250 dollars for natural fiber. 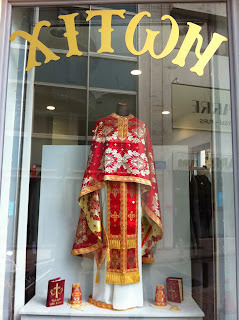 A kalimafi is around 70 dollars and the veil worn by celibate priests an extra 60. (1) Most texts I have read suggest that the emperor had a status very close to a deacon.